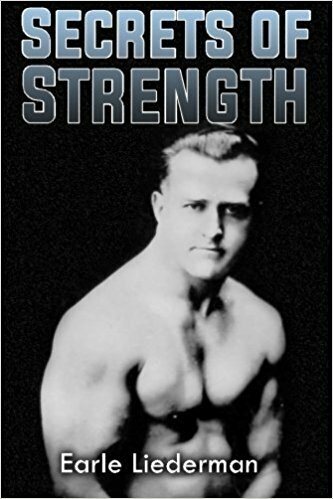 Now, as I have just said--and I cannot too strongly emphasize this fact--you cannot expect to develop strength in your arms unless strength is used in the movements. Therefore, anyone who continues light repetitions will never develop his biceps and triceps to their maximum. The work should be progressive, that is, the resistance should be increased as the muscles become stronger, just as you should do with other parts of the body. I cannot repeat this too often. You need not be afraid of straining the arms too severely, for no serious result can arise by performing too vigorous movements or too heavy movements with the arms. The biceps should be tired within ten counts. Any exercise you do that carries the repetitions beyond ten counts in order to tire the biceps is much too light for you, and you should therefore increase the resistance. The act of bending or flexing the arm, that is, starting from a straight position and bringing the fist toward the shoulder, constitutes the best means of developing the biceps muscle. If you pay attention to complete extensions and contractions of each movement, the biceps will develop to its fullest extent. Then if you desire strength and additional bulk to this muscle, you must increase the resistance or weight, as you progress with the work. The strength of the biceps muscle really depends upon the kind of work the individual performs. I have previously mentioned the various shapes and strength elements, based on my observation and experience in physical training. Heavy weights are excellent for strengthening and developing the biceps, and if persistent progress is made, the student will very quickly notice increase in the size of this muscle. If you want to progress, you cannot expect to use the same weight continually, and expect to gain strength in your biceps. Whether you utilize weights or some other apparatus, the resistance should be increased one or two pounds each week, and even more, according to your strength and progress. The resistance should be so graded that the biceps begins to feel uncomfortable about the fifth or sixth count, and at the eighth count it should start to ache. The ninth count should be done with effort, the tenth count with all the strength your arm possesses, and you should not be able to perform the eleventh repetition,. If you can tire your biceps muscle in this sort of work in even eight repetitions, it will strengthen your muscle much quicker. However, from experience, I have found that about ten repetitions are the best. The first four or five counts do not benefit you as far as strength and development are concerned, as the last four or five repetitions do. It is when your muscles begin to feel uncomfortable and you force them to do additional work that they develop and strengthen. This is the secret of the success of the strong man. If you will accept my suggestions and advice in these matters, and put them into practical application--and then keep at it--you will develop in a way you never dreamed of, and be a source of wonder to all your friends, who will marvel at your progress. 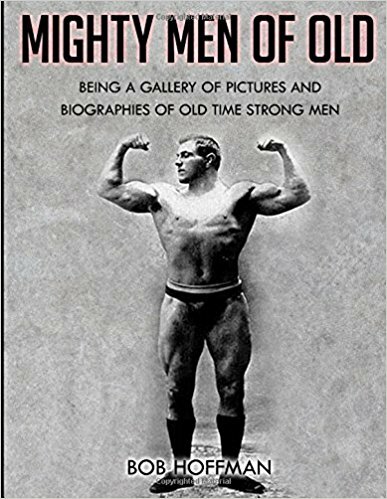 About ninety-five out of one hundred men and boys exercise in some form or other, yet out of these ninety-five physical culture enthusiasts you seldom find one well-developed individual. The reason for this is that ninety-four of the discontinue exercising a muscle as soon as a slight uncomfortable feeling is felt. Consequently the proper amount of work is never given the muscles. The ninety-fifth individual is the one who continues the repetitions and uses the proper amount of resistance, causing his muscles to ache, and thereby attaining the health, strength and development to which everyone aspires. I would not advise this severe progressive work with any other part of the body except the arms and shoulders, for if too much strain is placed on other parts, serious results might ensue. Yet the student need not have any fear of working his arms too much, providing he is not exercising them in coordination with his remaining muscles of the body. If you perform, for example, two-armed curl with an exceedingly heavy bar-bell, you are, of course, giving the biceps vigorous work and tiring them within ten counts, but while you are straining them with this bar-bell, you are also straining your abdominal muscles and various other muscles in your body as well, and remember, "a chain is no stronger than its weakest link." Some day something might snap. To avoid this, it is best to strengthen the arms individually during the first six months, if it is the arms you are particularly desirous of benefiting. And when working the arms individually no fear need be had of over-straining. As I have previously stated, I am a firm believer of exercising the muscles in groups. However, when performing group work and using the arms to coordinate with other muscles in your body, I advise the student to "watch his step" and experiment a month or two first with only medium heavy work, so as to strengthen the various other muscles brought into play when performing a two-arm curl with a bar-bell. This lack of preparation and development is the most serious objection I have to using heavy weights. The student is apt not to gauge his movements properly, and in consequence he may be handicapped for several years with a rupture. 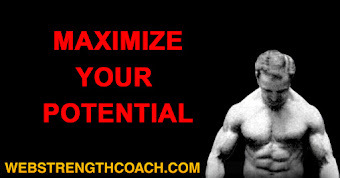 I have seen so many weight lifters ruptured that I shrink from advising the student to adopt weight lifting in his first endeavors to develop his physique. To avoid even the slightest possibility of any such result I advise the student to perform different methods of exercising for the first sox months with an exerciser, the resistance of which will increase the further it is stretched. The great advantage of an elastic exerciser is that at the beginning of the movement, there is absolutely no resistance whatever. However, the resistance increases as the arm begins to flex. Therefore, the more you flex your arm, the further you stretch the elastic and the greater you increase the resistance. By having an adjustable exerciser of this character, you will be able to add additional cables as your strength increases, thereby making the work progress in accordance with your own progress. There is not so much tendency to develop a strain when the movement is half completed as there is in the beginning of a movement, and when the movement is wholly completed, there is hardly any danger at all of becoming strained. An example of this can be shown with a two-arm curl of a heavy bar-bell. If the bar-bell should be too heavy for you, in fact, almost impossible for you to curl it, the effort you put forth in the endeavor will cause considerable strain around the abdominal region. If, however, you have managed to curl the bell so that the arms are a little more than half flexed, the strain will lessen, and when the curl is completed and the bell held firmly at the top of the chest, the only strain you will experience is practically the pressure of the weight on your hands. If you use a bar-bell not very difficult to start on the curl, and which places very little strain upon your coordinated muscles, you will find the bell much lighter as your biceps flex. For the biceps when flexed are more capable of performing heavier work than they are at the beginning of their flexion. Therefore, it is better, in my opinion, to begin a movement with an apparatus that offers very little resistance at the beginning of a curl, and the resistance of which increases considerably as you flex your arms, for, as I have stated before the arms become much stronger when the biceps becomes flexed. Another example of this can be shown in chinning the bar. It is comparatively easy for anyone who has exercised even to a slight degree to perform the ordinary two-hand chin; that is, to pull the weight of the body up until the chin is over the bar. 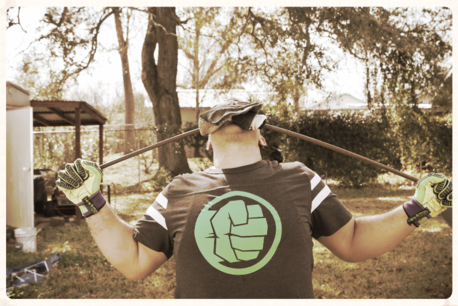 However, it is a very difficult feat of strength for even a trained athlete to perform a one-hand chin. On the other hand, it is a simple matter for the beginner to chin himself with two hands and lean all the weight to one side, while his chin is over the bar, holding himself up with the strength of his one arm alone. This simply shows the strength of the biceps muscle when it is thoroughly flexed and goes to prove what I have been telling you. 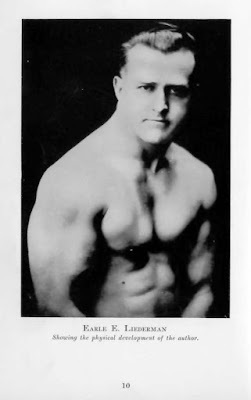 The fact that it is easy for anyone to hold himself at the completion of the chin with his chin over the bar with one hand, while he would find it impossible to begin to chin himself with one hand alone, shows that the strength of the biceps muscle at the start of the movement is greatly inferior to its strength at the completion of a movement. Therefore, it can readily be seen that the beginner, up to a period of six months, should not attempt heavy weight lifting for developing purposes. If he has obtained a fairly good physique, I recommend the use of heavy bar-bells and weights for strength and development purposes, providing he does not let his enthusiasm overwhelm his efforts. For, in my opinion, it is much better to be on the safe side and perform exercises systematically, with some scientific apparatus, rather than be in a hurry to strengthen and develop his muscles and make himself liable to a serious strain or a possible rupture. The muscles can be tired more systematically within ten repetitions with the use of a progressive elastic apparatus than they can with the use of a heavy dumb-bell. The triceps, or the muscles behind the upper arm, must be exercised just the reverse of the biceps; that is, the movements must be of pushing instead of pulling. Dipping between parallel bars is excellent exercise for this muscle, for it not only strengthens and develops the triceps, but it plays upon the pectorals and other muscles as well. As I suggested in the chapter on the chest, you should perform this dipping between parallel bars (or chairs, if you have no bars) with a weight or other resistance tied to the feet in order to make it progressive. The beginner may find this dipping between parallel bars a bit too strenuous. In that case I suggest he perform dipping or push-up on the floor until the triceps and pectorals become strong enough to try it between parallel bars. The use of a moderately heavy weight is also excellent for the triceps. The movement is started from the shoulders and extended to arm's length overhead. I would not advise the student to use a heavier weight than he is able to press up with a very slight bend at the opposite side of his waist, for if the weight is too heavy, he will have to resort to a bent-press movement. A bent-press exercise is entirely too severe for the beginner and should only be indulged in after the student acquires a fair amount of strength and development and is desirous of testing for strength a few times a week. If you are more enthusiastic about heavy weights than any other apparatus, I suggest you do not use them more than two or three times a week, for the use of weights oftener than this will have a tendency not only to slow you up, but it will tear down the tissues more quickly than they can be replenished. In order to acquire the best results from exercising with heavy weights, the work should be done about three times a week, thereby giving periods of rest in which to recuperate and build up the muscles. 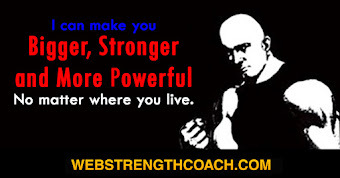 In advocating heavy weights, understand, I am doing it merely for strength purposes, and not for development. For as I have said, far greater progress can be made in developing by other means of exercise. 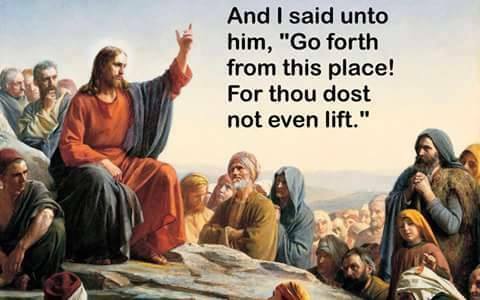 To the person who does not use heavy weights, I suggest he exercise daily, for exercising for development purposes is not as hard, or as straining as exercising for strength purposes, and consequently fifteen to thirty minutes daily spent on the physical welfare of your body is not too much time. 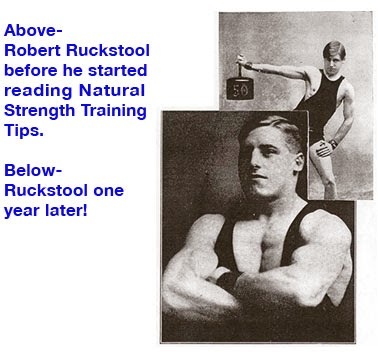 Whereas, if the student followed the every-other-day program, as in weight lifting for strength purposes, it would not be sufficiently rapid progress for his development. The triceps, being a three-headed muscle, is much stronger than the biceps, which has but two heads. Therefore, a greater amount of resistance can be applied to the triceps than to the biceps. If you are desirous of developing the triceps rapidly and to their maximum degree, you must not use the same weight or resistance that you use to exercise the biceps with, but you should increase this resistance at least 25 per cent or more. For example, if you are working with the biceps against a resistance of 50 pounds, you should add at least 12 to 15 pounds more, if you use the same weight or apparatus to exercise the triceps. This percentage will vary greatly with different people. The average untrained person possesses biceps that are much stronger than his triceps, but after he has been exercising for a short while, his triceps soon excel his biceps in strength. It will, therefore, be possible to use a weight or resistance in exercising his triceps that he will find impossible in exercising his biceps. For instance, the untrained individual can chin himself more times than he can dip, but after he has practiced both for a short period he will be able to dip more times than he can chin. EXERCISE 1. Stand erect. Hold bell at sides. Bring bell to shoulders. Thoroughly flex the arm and lower again until the arm is straightened. Repeat. This can be performed also with a progressive exerciser. At the same time use a heavy enough bell or strong enough resistance in the exerciser until the muscle is aching. This aching point should be reached within ten repetitions. I would not advise a beginner to use a bar-bell and both arms at the same time until he has obtained a considerable degree of strength and development, but the arms should be worked individually in this biceps exercise. EXERCISE 2. Bend forward and lift the bell off the floor about two inches. Then curl bell to shoulders, without touching any part of the arm to the body. This works the biceps muscle, but in a much harder way, and will naturally tire the muscle quicker. The weight of the bell should be increased as the muscle strengthens. In no case have the bell so light that it will not tire your muscles out in ten repetitions if you desire to make rapid progress in the development of the biceps muscle. Now do both of these exercises with a somewhat lighter weight, but begin the curl with the palms reversed, so that when the curl is completed, the palms will be facing the floor. This will work the biceps in a different way and also call into play the supinator muscles of the forearm. You may find in this case that the supinator longus muscle of the forearm will tire before the biceps. While exercising the arms your should concentrate your attention on the muscle used, for this will stimulate the effort and help you with your progress. If you allow your mind to wander when doing these exercises, or any exercise, in fact, you will not get as much good out of them as you would if you devoted your entire attention to this movement. Think about the muscles you are exercising and, if possible, stand in front of the mirror to watch them work. Do plenty of chinning-the-bar exercises. If you can chin the bar more than ten counts, tie a weight to your feet. Whether you use a dumb-bell with a rope arrangement or whether you make use of elastic cables for this purpose, you will find it will help your progress considerably in the development and strengthening of the biceps muscle. If you are able to chin yourself with a 50-pound dumb-bell tied to your feet, you should make attempts at the "one-arm chin." This is a matter of practice. If you will endeavor to keep the palm of your hand and arm facing your body your efforts will be better in attempting this one-arm chin than if you allowed your body to turn while hanging by one arm before beginning this chin. EXERCISE 3. Hold the dumb-bell at the shoulder and push to arm's length overhead. This should be done in a military fashion. In other words, do not bend at the waist any more than you can help. If the weight should be so heavy that it compels you to bend sideways, be sure to keep the palm of your hand facing your body. Do not turn the wrist. The beginner may find his deltoid or shoulder muscle the first muscle to tire in this exercise, but with constant practice, he will strengthen his shoulder muscle so that the main resistance will apply to the triceps. I find that excellent results can be accomplished in this exercise by the use of a progressive exerciser. If the exerciser is held behind the back with one arm still and the other arm ready to begin the movement at the height of the shoulder, as shown in the illustration, the triceps will receive more individual work in the upward push, because of the gradual increase of resistance as the exerciser is stretched. When the arm is at your shoulder, you have practically no tension or weight pressing on your hand with the use of this apparatus. But the further you push your hand overhead, the stronger the resistance becomes and the more your triceps muscle is put into play. In performing arm work, always be sure to do the same amount of work with the left arm as you do with the right. Do not perform additional movements with your right arm because it may be stronger. If your left arm is weaker than the right and is lacking in contour or development, you should endeavor to perform one or two extra counts on the left side in order to eradicate all defects and develop your arms to symmetrical, equal proportions. EXERCISE 4. Hold the exerciser overhead with one arm and have the other hand at the height of the corresponding shoulder. Then, while keeping the exerciser held aloft, with arms stiff, push other hand downward until the arm becomes straightened. This also gives the triceps plenty of work and with the proper resistance the muscle can be easily tired in less than ten repetitions. EXERCISE 5. Hold bar-bell at height of the shoulder and with legs spread forward about 12 or 18 inches, press the bell slowly upward, until the arms are straight. Then lower and repeat. Have the weight adjusted so as to tire your muscles within ten repetitions. This also affects the triceps directly and will strengthen and develop them. 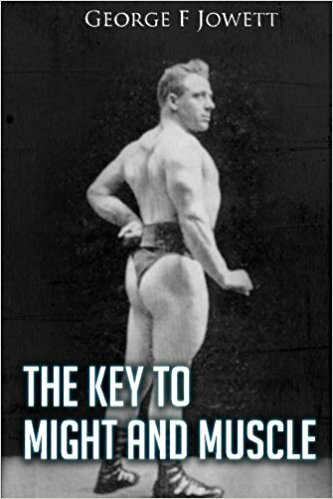 The reader must not confuse dumb-bell or bar-bell exercises with the term "heavy weight lifting for strength purposes." If the student does but the few bar-bell and dumb-bell exercises I have outlined, he can perform them daily, but if he attempts to see how much he can lift every day, or performs exercises so strenuous that he is unable to do more than three or four repetitions, he should not attempt this arduous work more often than three times a week. Otherwise he will become "stale" by not giving the muscles a chance to build up. There is no need for me to give a list of exercises for the biceps and triceps here, because the reader can easily outline additional work for himself, if he s desires. 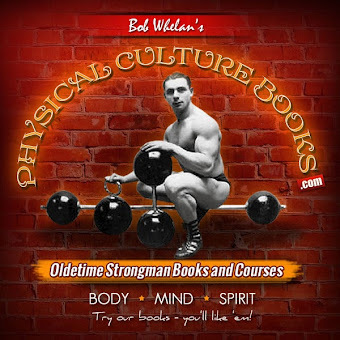 I am simply outlining a few exercises for each muscle and the student can easily develop his entire body by performing the movements I have outlined for him in these pages. I have also given the reader a choice between a bar-bell and a progressive exerciser, to adopt whichever he prefers, and according to his experience with training. If you are a beginner, take my advice and leave cumbersome bar-bells alone and use an elastic exerciser; but if you have over six months' experience with heavy work, then you need have no fear in attempting bar-bell work.